Yesterday the newly-launched J. Ronald Terwilliger Foundation for Housing America’s Families released The Silent Housing Crisis, a white paper documenting the significant housing challenges facing the country and making a call to action by the nation’s political leaders. The paper presents a succinct and compelling portrait of the doleful state of housing affordability in the country, the worrisome drop in opportunities for homeownership, and the demographic forces that are likely to exacerbate these problems absent efforts to reverse these trends. The Foundation is right to label housing affordability a national crisis, particularly among renters. At last count, nearly half of all renters were cost-burdened, spending more than 30 percent of their income on housing, and more than one in four were severely burdened, devoting more than half of their income to rent. This translates into 21 million cost-burdened households, including 11 million with severe burdens. 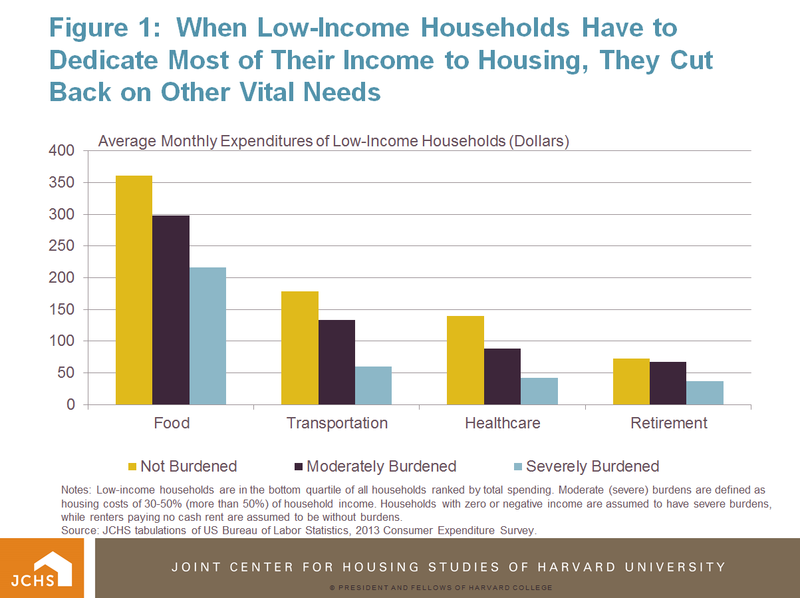 Low-income households in this situation are forced to make painful tradeoffs between housing and other fundamental necessities of life; among households in the bottom expenditure quartile, those with severe housing cost burdens spend 40 percent less on food, 70 percent less on healthcare, and 49 percent less on retirement savings each month (Figure 1). Notes: Low-income households are in the bottom quartile of all households ranked by total spending. 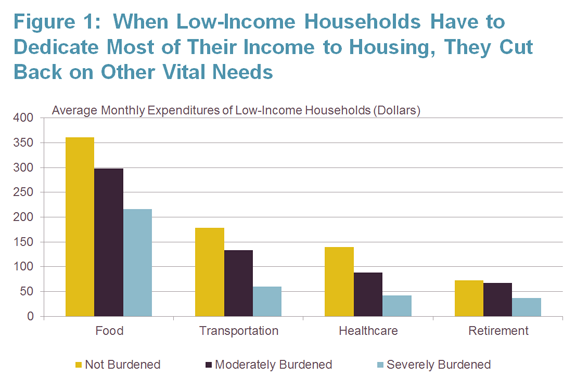 Moderate (severe) burdens are defined as housing costs of 30-50% (more than 50%) of household income. Households with zero or negative income are assumed to have severe burdens, while renters paying no cash rent are assumed to be without burdens. Source: JCHS tabulations of US Bureau of Labor Statistics, 2013 Consumer Expenditure Survey. Housing affordability has been steadily worsening for years, but the last decade saw the situation go from bad to worse, leading to today’s crisis situation (Figure 2). 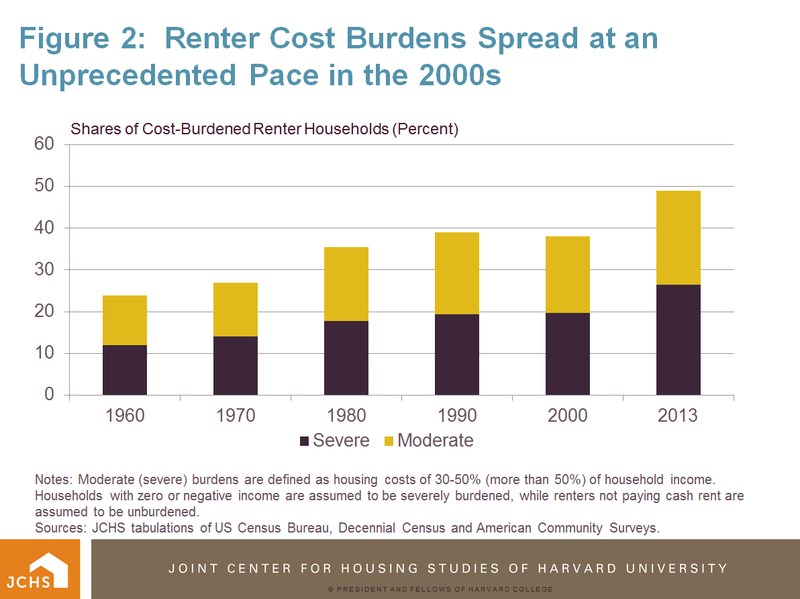 In 1960 the share of renters with cost burdens was roughly half today’s levels. Amazingly, half of the increase over the past fifty years has occurred since 2000 as falling real incomes have combined with rising real housing costs to put housing out of reach for ever more families and individuals. And there’s no prospect of meaningful improvement ahead as incomes have yet to rebound from years of declines, and surging demand for rental housing is outpacing developers’ ability to build new homes. 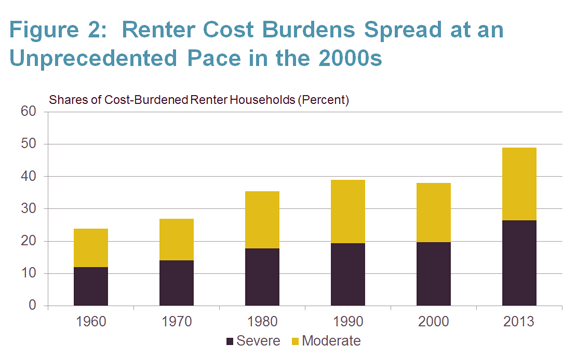 Notes: Moderate (severe) burdens are defined as housing costs of 30-50% (more than 50%) of household income. Households with zero or negative income are assumed to be severely burdened, while renters not paying cash rent are assumed to be unburdened. Sources: JCHS tabulations of US Census Bureau, Decennial Census and American Community Surveys. Notably, as our State of the Nation’s Housing report to be released next week documents, the largest deterioration in rental affordability has occurred among those making between $30,000 and $45,000, particularly in higher cost markets. But the problem is most extreme among the lowest-income households. Among those earning less than $15,000—which is equivalent to working year-round at the federal minimum wage—roughly three-quarters of households have severe cost burdens. Households at this income level households would have to find rentals going for $375 a month or less to stay within the standard affordability guideline, so it is not surprising that so many are cost-burdened. On its own, the private sector simply cannot provide housing at such low rents. As a result, there is much less variation in the extent of cost burdens among these lowest income families across markets—those in Detroit are as likely to be severely burdened as they are in San Francisco. If the housing affordability crisis is silent, it’s not for lack of research that documents the extent of the issue. In just the last month, analysis by the Urban Institute, the National Low Income Housing Coalition (NLIHC), and NYU’s Furman Center have all documented the astounding extent of affordability challenges across the county. The Urban Institute’s Housing Affordability Gap report finds that, nationwide, for every 100 extremely low-income renters there are only 28 units that are affordable, in adequate condition, and not occupied by higher income households. NLIHC’s Out of Reach report finds that there is not a single state in the country where someone working year-round at the federal minimum wage can afford a moderately priced two-bedroom rental. Focusing on 11 large cities, the Furman Center’s report drives home the point that these challenges are evident in a diverse range of cities, finding that even in the most affordable cities low-income renters could afford no more than 11 percent of recently available units. Adding to these numerous efforts to quantify the extent of the problem, the Enterprise Foundation’s Make Room campaign brings this raw data to life by telling the compelling stories of families across the country who are struggling with severe rent burdens—and the very real consequences it has for their finances and their ability to get a foothold in the middle-class. While the absence of affordable housing has largely been a silent crisis, there does seem to be growing public awareness. The MacArthur Foundation’s latest How Housing Matters survey finds that a majority of the public (60 percent) identifies housing affordability as a very or fairly serious problem in America today. And three quarters agree that it is very challenging for a family of four with income under $24,000 to find affordable housing. But the survey also finds that only 39 percent of the public agree that the federal government should be involved in addressing housing affordability issues. Given the magnitude and extent of the housing affordability crisis and the growing awareness of these issues, what seems to be missing is the political leadership needed to identify the lack of affordable housing as a national challenge and to make a case for action by the public sector. The mission of the new Terwilliger Foundation is to foster engagement with this issue among political leaders from both sides of the aisle and to jump start the policy debate by identifying practical suggestions for how reform of federal efforts can better address the country’s housing needs. It is a laudable effort and, with growing evidence of the extent and persistence of the housing crisis, hopefully one that will gain traction in the upcoming Presidential election season.